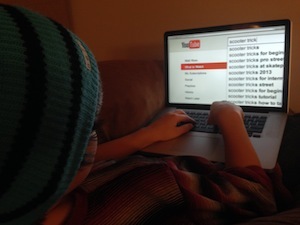 "Duh Dad, You just YouTube it" | DigitalHipster Inc. Think video production isn’t important for your business? I asked my son how he figured out how to do a 360 on his scooter and he didn’t say he read about it. He said, “Duh Dad, you just YouTube It.” For the record my son wants it known that he actually learned this a few years ago, even though I’m writing about it now -gotta protect his scooter reputation. The thought of finding a great book by someone who researched the topic and oh I don’t know maybe had a deep background on the pros and cons of cracking your head open for coming in at 340 degrees vs. 360 degrees probably never crossed his mind. Because to a ten year old living in 2012, the’ve never even heard of VCRs, let alone cassette tapes or what their grandparents listened to… 8 tracks. But it’s not just kids who search for video. A recent blog post by Forrester Research, says “that video was the fastest-growing digital content category” and “90% of the online population will watch online video by 2017.” Add to that Facebook kicking off auto-starting videos for both advertising and posts last month, and you can see where this is headed. Quality video production can significantly improve your search engine rankings and lead to more customers. You can’t afford to not have video on your website. According to Forrester, “you’re 53% more likely to show up on the first page of Google by having a video.” A video allows a customer to get to know your business on a more intimate level. If you are in the home improvement industry, medical industry or any industry where people search for “How To Videos,” you are missing an opportunity to position your company as an authority and great resource for information about your industry- and that ultimately leads to more customers. Just having a video on your website is a great start, but it’s also important to optimize it for online searches. One way to do this is to first put it on your company’s YouTube channel. If you need help setting up a YouTube Channel, we can help. Once you have your video on YouTube, be sure to title it, tag it and create a description that is relevant to what your potential customers are searching for. Next, you should embed it in your website and optimize that page of your website as well. That’s a great start, but you’ll still want to get the word out about your video through Social Media and Online Marketing for those who could really benefit from your knowledge, but are not already searching for it. Hopefully this tip helps to really get your business off to a great start in 2014. Here’s more about our video production capabilities.